Magic Wand — iridescent fine shimmer with a subtle lavender glow. EDIT November 2009: this set is being discontinued. Apparently this was put together when Aromaleigh first started selling mineral makeup, and was not removed as original colors and products were added over the years. Beginning November 2009, the final jars of Pure Hue Intense Pigments were sold at a deep discount. 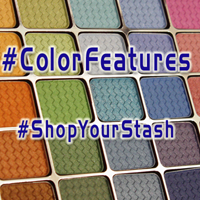 Those caveats aside, if all you want is a small sampling of a particular mica powder color and are ordering enough to be able to use the coupon, OR you don't want to try mixing the larger quantities to get exactly the same color as Aromaleigh's, then - by all means, go for it. It's not a low-quality product. It's just more costly in comparison to other vendors.